The thought of Jesus washing the feet of His disciples always stirs my heart. John 13:13-15, "You call me 'Teacher' and 'Lord' and rightly so, for that is what I am. Now that I, your Lord and Teacher, have washed your feet, you also should wash one another’s feet. I have set you an example that you should do as I have done for you." 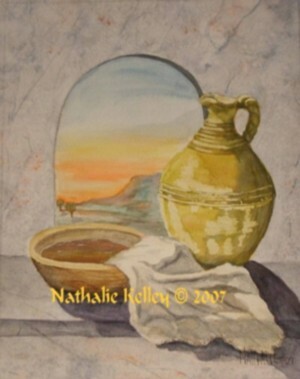 The "Basin and Towel" represent the time was humbling to both the Lord and His followers. It is very humbling to wash someone's feet and even more so to be the recipient of the act. The horizon in the background can be seen in two different ways. One is Jesus' earthly ministry drawing to a close (sunset) and the other, the beginning (sunrise) of the disciples' ministry. Let this painting be a reminder, "I have set you an example that you should do as I have done for you."